I have lived on the lip of insanity, wanting to know reasons, knocking on a door It opens. I’ve been knocking from the inside! 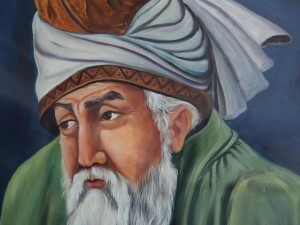 “Living on the lip of insanity” is Jelaluddin Rumi’s thirteenth-century description of an internal state of mind, a desperate search for meaning when old explanations no longer make sense and all the signposts of convention and morality have been obliterated. The poet must think for himself. It also describes American public life in our time of diminished imagination. “Madness at the gates” may be even better. We construct walls to protect against the terror outside. Inside, we distract ourselves on the twin towers of consumerism and fundamentalism, but anxiety drains our vitality. Accidentally lifting the veil of denial, we view the madness on this side of the wall, and shocked by the implications, we quickly drop it. Long before 9/11 our noblest intentions became corrupted into their opposites. America once symbolized to the entire world a place of opportunity, where people could overcome the past and begin anew. But this great imagination evolved into a myth of innocence and exclusion. Americans came to believe in a story that all capacity for goodness resided here, within the walls, while absolute evil stalked us from out there. Introduction means, “leading inward.” I invite you inside our mythic walls, to examine your own ideas of freedom and individualism, and of what it actually means to be American in this world. I hope to facilitate an initiation. Acknowledging that we’ve dug ourselves into a hole, we must first stop digging, to understand our collusion with stories that no longer work. Only then we can begin – initiate – something new, to drop our innocence, evolve new myths and rejoin the human and natural communities. The characters in myths may change, but myths themselves never die. “They are only sleeping at the bottom of our minds,” wrote poet Stanley Kunitz, “waiting for our call.” Myths are the stories we tell ourselves about ourselves. They organize and justify existence and also speak to our unresolved conflicts, needs and fantasies. They grab our attention. The world’s oldest stories appear in our dreams, our relationships – and our politics. Mythic patterns often constrict our hopes to grimly predictable results, but only when we live our lives unconscious of them. Indeed, awareness of our myths is critical to breaking out and imagining new – or extremely old – solutions to our terrible contemporary problems. So my writings ask what myths do all Americans share? What myths are our leaders enacting for us all? Greek myth in particular remains vital because each generation, and at each stage of life – adolescence, productive adulthood, elderhood – we perceive new meaning. When we consider myths from the perspectives of different characters, we gain insight. No single version can completely encapsulate a myth. Some say that myth is always multiple in meaning, reflecting our own multiple “selves.” Perhaps the very attempt to analyze is misguided. “Explain” means to flatten and limit. This is certain: myth’s fundamental themes can still move us as deeply as they affected fifth century B.C.E. Greeks. Why study myth, beyond its entertainment value or for moral instruction? As the post-modern world lurches toward the disasters and bereavements that signal the end of an age, I look to myth to comprehend the elemental forces that move through our lives, to know who we are. We must know which stories inform our consciousness. For a long time, we have heard stories telling us that hatred is inevitable and that violence is the only way to resolve disputes. Is this the only story of who we are? Whether we like it or not, we are actors in stories that have played out countless times. The myths are not in us; we are in the myths. Indeed, we each live at an intersection of several myths. But the most profound myths don’t provide answers; they provoke the imagination, inviting us to plunge deeper into life. Why should we care about ancient Greece? The reasons have changed greatly over the 500 years since Europe rediscovered Plato and the Parthenon. Renaissance artists, after 1,500 years of Church restriction, found thinkers like themselves who had valued the individual and praised the beauty of the human body. Eighteenth century progressives discovered democracy’s inventors, and their revolutions influenced social change movements everywhere. Romantic artists and poets created images from the old stories that conveyed relational and feminine values. Nineteenth century researchers realized the Greek foundations of science and psychology. Individualism and science replaced the old, tired religious dogmas as modernity’s highest ideals. The Renaissance, however, also saw savage religious wars and witch burnings. Eighteenth century colonialism ravaged tribal culture, and the nineteenth raped the Earth itself. In the twentieth century, humanity endured world wars, unspeakable genocides, nuclear devastation, environmental decline and frenzies of conspicuous yet unsatisfying consumption. Glorification of the individual brought narcissism, loneliness, broken relationships and alienation – the condition of being outsiders who feel estranged from society and from our own bodies. Careless inattention to democracy resulted in the tyranny of corporations and religious fundamentalist. Now we live in a state of constant fear and unending war. Science birthed the most powerful god of our age, materialism – which mocks our creative and spiritual lives. Reduced to the category of environmental rapists, we joke nervously about spending our children’s inheritance. Still, despite the dissatisfaction and complaints that life was better in the “old days,” few of us have any sense of just how much we have lost, how deeply diminished our lives actually are. Who can remember how much we have forgotten? Meanwhile, fundamentalist alternatives address our spiritual vacuum but leave us malnourished. We fear – perhaps we wish – that we’re at the edge of catastrophe (“to turn downward”). Veiling our anxieties, we know we must ultimately face a vast, ancestral grief that edges closer with each headline. Yet underneath the masks of believer, consumer, normal neurotic or adult child, lives something older – an indigenous soul. Searching for this soul, millions have sampled Asian spirituality and discovered contemplative practices that ground their lives in fundamental values. Others, however, found those forms that evolved on ground not of their ancestors to be too alien. Now, when we look to Greek myth, it is because we need to be nourished by modes of meaning that fit our own consciousness. The American soul needs the images that Europe created before Christianity. Here is the danger of not knowing our myths: if we remain unaware of trauma, we run the risk of continuously enacting it. Since the 1970’s women have re-imagined Greek images. Athena, Aphrodite, Persephone and Artemis are the guiding deities of feminism. Still older goddesses – Demeter and Gaia – are the Earth Mothers who inspire environmentalism. Behind them all stands Mnemosyne, memory herself, mother of the Muses. 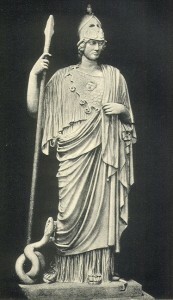 The Muses serve her by rendering her essence – history – into art. The memory of more natural ways has never left our indigenous bones. The ancients knew that it was only Memory, giving birth to art, who could defeat Time. Men, however, have been privileged to assume masculine images of God, which, sadly, are the models for tyrannical rule at all levels of organization. Men must confront the entire history of patriarchy and understand how divine figures like Zeus and Apollo – and Jehovah and Christ – were constructed to oppress women. But they are much more than symbols of male control. With potency reaching beyond the psychological, they model the human psyche’s astonishing diversity. Though dormant, they can still feed us. However, they demand attention, respect and active, collective participation in the difficult process of renewal. The psyche has infinite depth, and it can be transformed. Psyche, or soul, was also the Greek word for butterfly, the beautiful creature that grew miraculously, from a caterpillar. If psyches can transform, then so can nations. My book, Madness At The Gates Of The City: The Myth Of American Innocence, uses an old myth to look at our history and culture. Euripides’ play The Bacchae was first presented in 406 B.C.E., near the end of the long Peloponnesian War that destroyed Greek democracy. Highly controversial then, it still has surprising appeal to modern readers, with its startling parallels to the events of September 11th, 2001. 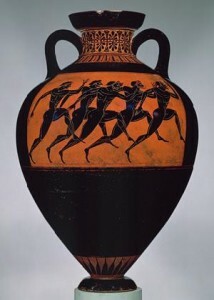 The god Dionysus drives the women of Thebes mad, leading them beyond its walls in ecstatic celebration. 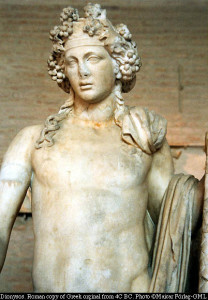 King Pentheus imprisons Dionysus, but the god escapes, causing an earthquake that destroys the palace. Pentheus responds by threatening to call out his army. By analogy, we are like Pentheus at this point halfway through the play. Several years after 9/11, America stands arrogant and alone, projecting our darkness onto dark-skinned people, denying the presence of an immense force that grows more destructive because we never heed its warnings. Throughout the book, I stress the power of imagination, which Albert Einstein declared is more important than knowledge. We must learn to stretch our imagination backward, past our more recent Judeo-Christian mythologies of misogyny and violent redemption. We need to comprehend our myth of innocence, to understand the American stories we have inhabited – fully, painfully – before we can re-imagine them or tell new ones. More than any people in history, we suffer from a queasy rootlessness at the foundation of our identity. Its source is the bedrock of unexpressed grief for the incomprehensibly massive suffering that white Europeans have inflicted on this continent, its indigenous people and the black slaves they brought here. TV commercials give us peaks at the despair we struggle to veil, bombarding us with images of happy kitchens, new cars on pristine coastlines and family reunions. What is it we long for, and why do we feel so manipulated? “Nostalgia” (Greek: “return”) longs not for another time, but for another place. Even after four centuries of white (and black) residence on this land, we tread uncomfortably – and disrespectfully – upon it. We remain exiles, uninvited guests longing to be welcomed, to call it home. It will be lengthy and painful, but the way is through re-awakening our indigenous souls. Learning who we are, below the easy identifications with nation, ethnicity and brand names, will lead us to love where we. Myth implies that our troubles have happened before, and that there is still time to change, to awaken from this dream of innocence and return home. Why emphasize politics in a book on mythology and psychology? Or why dwell on mythological themes in a book on history? Does it help to view history through a mythological lens? Can we find a deeper meaning in 9/11? Indeed, haven’t our conventional economic, political, psychological and theological explanations for this madness failed us? What does the madness itself want from us? Mythology connects psychology and history, inviting them both to deeper truths. As a student of myth, I am a generalist, working – like Dionysus – at the boundaries. With apologies to academics in Classics, History, Psychology, Literature, Religion, Sociology, Anthropology, Economics, American Studies and Popular Culture, I look for the mythic patterns that underlie events. I hope to convince you to think mythologically, to muse on the archetypal images that can help us understand our situation. Knowing the stories that arise in the mind (as dream and poetry) and the community (as myth) will help us penetrate the unique narratives that make up “America.” I trace several themes through history, always with one eye on the mythic issues. It will be useful to compare America to ancient Greece, but also on even older perspectives, the bone-memory of so-called “primitive” people. If we can’t imagine – and mourn – how much we have lost, then we lack the capacity to imagine real alternatives. We must unveil an immensely old double amnesia; we’ve forgotten that we have forgotten how to live in harmony. All this will be necessary before we can begin to tell new stories. To deepen the American Dream, we must first awaken from it. Like actors in an annual religious drama, other forces are determined to help America lose that innocence. And the cycle continues. Who remains innocent in this world? What does our insistence on innocence force others to bear? How long can they bear it? But I want to go deeper. “What is madness,” asked another poet, Theodore Roethke, “but nobility of soul at odds with circumstance?” I want to pursue the myth of innocence to its core; perhaps there, only there, will we re-discover America’s nobility. 1 – To clarify the mythic themes in American history. 2 – To encourage mythological thinking. 3 – To support the re-emergence of initiation, authentic ritual, the oral tradition, deep memory and the imagination. 4 – To confront readers with the hidden bedrock of their value systems. 5 – To avoid muddling things with academic jargon. 6 – To circle around these themes in a Hermetic, Dionysian, soulful, non-linear manner, showing more interest in surprising connections and brief liftings of the veil than in logical proof. 7 –To re-imagine America’s purpose in the world.